The Victorian Football Association (VFA) was formed in 1877 including Senior and Junior teams. The teams in the VFA have varied over the years and at least 50 different clubs have competed in the VFA competition. The creation of the VFL in 1897 caused the loss of many clubs. The next big change occurred from 1925 with loss of Hawthorn, Footscray and North Melbourne to the VFL and the folding of the Geelong (VFA) team. During this time, new teams entered the competition to fill the gaps and the VFA was expand to 12 teams with the inclusion of six new teams (see dates below). The 1950s and 60s saw the VFA expand into an 18 team competition with two divisions. Boyles VFA photos are taken mainly in the 1930s and reflect the VFA team list from that era. A summary of participation in the VFA is shown in the table below. Many teams participated in the VFA over its lifetime. The VFA was renamed the VFL in 1996. Rules of play at VFA matches have not always matched those in the VFL/AFL. The VFA was often innovative and introduced playing conditions before they were later adopted by the VFL. 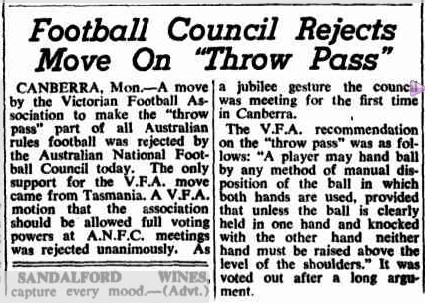 In 1949 the Association joined the Australian National Football Council (where they stayed until the 1970s) and changed their rules so that the throw-pass was no longer allowed at VFA games. 1929 One substitute Allowed (Introduced one year before the VFL). Team photos from 1929 may feature 19 players, though often feature only 18. During the 1930s the VFL and VFA both played with rules that meant there were no boundary throw ins. This favoured play down the centre of the field. During this period a number of full forwards achieved 100 goals per season. The boundary throw in was re-introduced into the VFA in 1938 and into the VFL in 1939, this spread out the play and reduced the importance of the full forwards.